Another photograph from the Packhorse Fair in Bruton the other week (May 2016). Or rather, seen near the Packhorse Fair – not necessarily anything to do with it. Like most blokes, I can’t resist an old car. 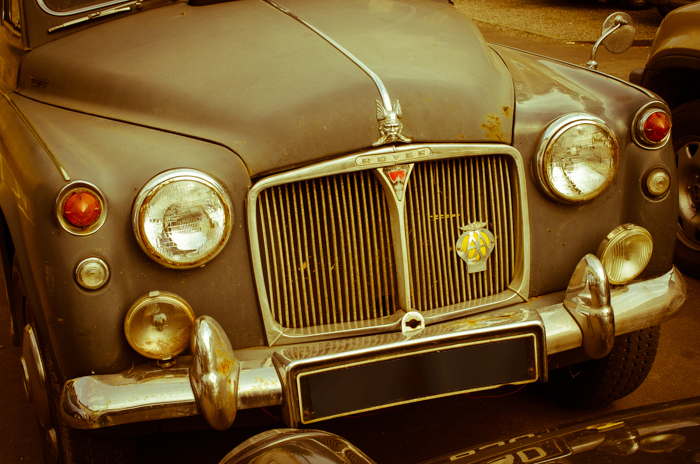 This is an old Rover 95, from the early 1960s, at a guess. It looked like it was at the beginning of its journey of restoration, rather than at the end of it. Someone has a lot of work on their hands. Good to see it running, though. I’ve masked the number plate – never quite sure what to do about that. Apparently it IS legal to photograph and reproduce number plates, since they are on public display and anything public can be re-shown to the public, but still, I wouldn’t want to offend anyone, so there it is filtered out.